Cucina Povera: Be Very, Very, Quiet - I'm Hunting Vintage! Be Very, Very, Quiet - I'm Hunting Vintage! I love old kitchenware. I get deep pleasure wandering around Op Shops and Junk Stores and finding pieces to fill my kitchen with. Vintage things are so full of history and were really made to last. I enjoy digging around and finding old collectible pieces, imagining where they came from, and what stories they could tell. I was in a bit of a stinky mood today, so I decided the tonic would be to take myself Op shopping. I was feeling lucky and I always like to follow my instincts. It was a busy Thursday. There were people everywhere. I giggled to myself as I watched a lady in the car park attempting to stuff a large wooden toy trunk into the boot of her car without success. I was thinking out aloud, 'Should have thought that one out a little better lady' and then thought that if it were me, I would have done whatever I could to get that trunk home, come hell or high water. When Op shopping, my usual modus operandi is to go to the clothing section first, but today I went straight to Bric-a-brac. 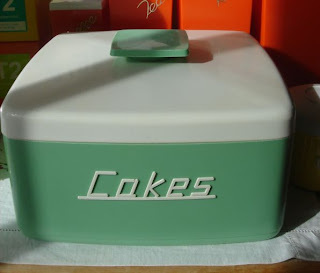 I am glad I did because it was there I found this wonderful old Nelly Ware cake canister. Isn't it delicious! OK, maybe I am a little over zealous, but for $5 I knew I absolutely had to have it. I mean, being a self-styled baker, how could I not get excited? As I continued browsing, a lady rushed up to me saying 'WHERE DID YOU FIND THAT? ARE THERE MORE? I COLLECT RETRO! I MUST HAVE IT!' to which I felt like replying 'You can prise it off my cold, dead fingers lady' (I told you I was in a stinky mood!). Instead I smiled sweetly and said 'Bric-a-brac, I guess today is my lucky day!' and I merrily skipped away. (Well, in my head that's what I did). I went to the cashier to pay and then she was all over me like a rash, wanting to know if I knew what it was, how valuable Nelly Ware is these days, how hard it is to come by, and that her Nanna had one just the same that she wished she had kept and was disappointed that she didn't. At this point I couldn't wait to get out of the store! I am so happy I bought it, it really made my day and dissolved my crummy mood! 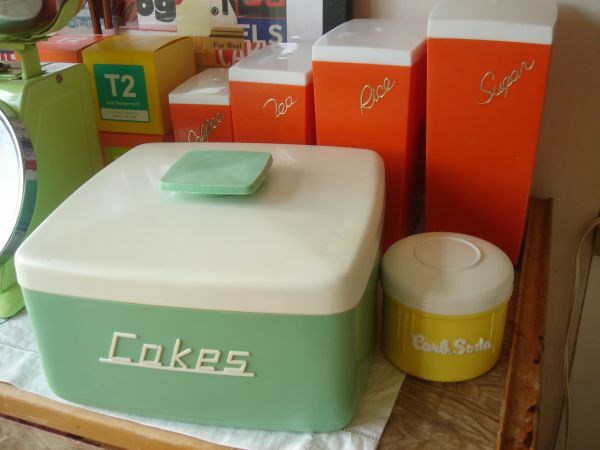 I am certain it will be quite at home with all of the other retro and eclectic pieces in my kitchen that all have their own stories to tell.